Military and civilian government personnel who held positions that required them to deploy on immediate notice were the first use a “Go Bag.” Today, they serve a much broader range of needs. Preppers, people living in areas requiring the need for evacuation, frequent travelers, and hams all maintain go bags. The purpose of a go bag typically determines its size. 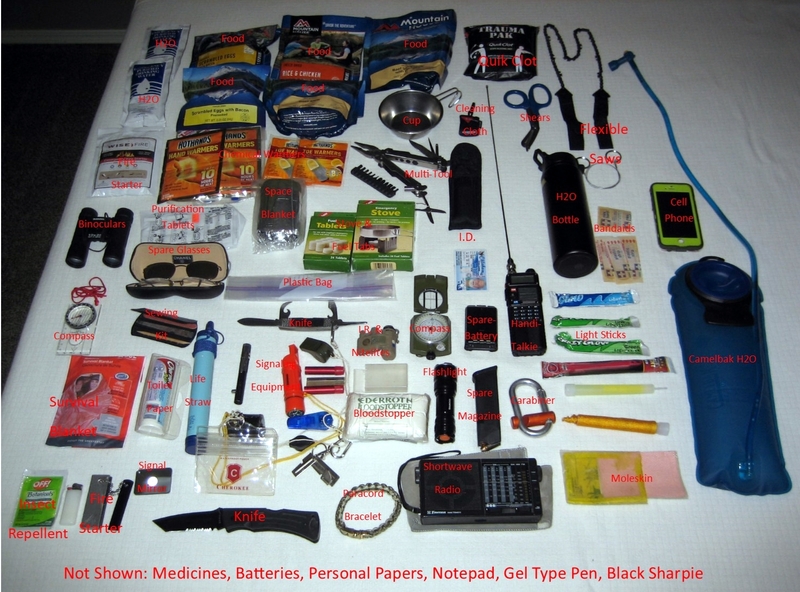 Hams and preppers generally build a 72-hour or 3-day kit. Today, we are going to focus on the bags themselves. Size of course is on everyone’s mind. Always keep in mind that you may be forced to put the bag on your back and walk. For this reason, suitcases are ruled out since we may be going cross country at times. Next, be realistic in your thinking. Afterall, even Marines limit themselves to 80 lbs. and if you aren’t in the same physical condition as a Marine, your load will be much less. Keeping that in mind, we can focus on size, shape and design. You aren’t going to find waterproof bags, but most are water resistant. Don’t waste your time or money on thin, shapeless, bags to save weight. They won’t hold up, will split at the seams, or the zipper will fail. The better bags are Cordura Nylon, usually with a rubber type backing to repel heavy downpours. The zippers will be larger with heavy duty openers, tabs or rings, making access even faster with gloves on. Color is quite the personal preference. Some want bright, stand-out colors, like fluorescent orange or lime green, while others prefer black, camo or desert colors. Another consideration is the number of compartments, outside and inside pockets help to setup your pack by function. Larger compartments can be used for food and clothing, while, while smaller ones may be dedicated to fire making, first aid, or pathfinding. It’s your pack, there is no right or wrong, make it work for you. Next, is load-bearing. Put them on your back and adjust the straps – all of them. Remember, once it’s loaded determine how it fits you and how well it distributes the weight. Well padded shoulder straps are a MUST! 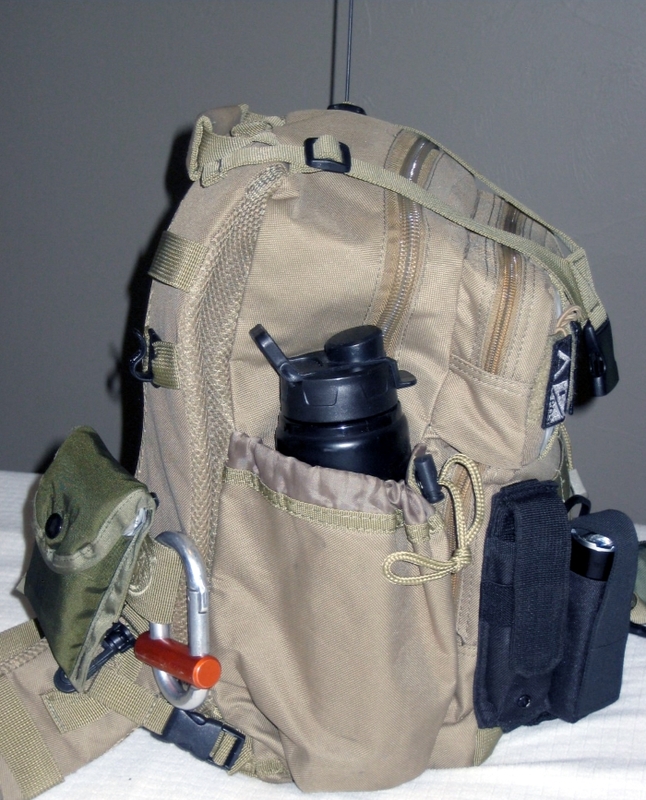 Also consider some of the newer packs that have compartments for a water bladder, such as the “Camel Back” design. Lastly, it is always better to buy bigger than you think will be needed, just don’t go overboard and buy a huge 4,000-6,000 cubic inch bag. Remember, you aren’t a Marine. We all have specific needs that do not change when you are away from home. We take medicine, wear glasses, and may even have to pack for others that depend on us, like children. Whatever these needs may be, they do not stop because we are “out of pocket.” We must include those items in our go bag. try to keep your medicine air and waterproof. Plastic sandwich bags and larger resealable plastic bags are a great way to store your medicine. Lay out your morning pills, put them in a sandwich bag in a knot and cut off the excess. Repeat two more times, and you have three mornings worth of pills. Put them in a small resealable bag labeled “Morning Meds” and then repeat the process for all the other times (Midday, Dinner, Bedtime) you must take medicine. You can use commercially available pill sorters for this task. If the pillbox is not waterproof, slip it into a plastic bag and seal it up. Here is the part that is going to require some work past this initial phase. Medicine may expire, so you can’t just do it and forget it. A good rule of thumb is to rotate them out every three months. On your phone calendar, or on the one of the fridge, make a note to replace the pills in your go bag. While you are at it, replace all the batteries on a regular basis. The last thing you need in a crisis is a dead flashlight, or radio, or whatever. You pick the timetable. Just do it. Spare prescription glasses, thick socks, and underwear are also personal items you must review. Other personal items such as sunscreen, insect repellent, lotion, lip balm, etc., must be sealed in a plastic bag. The last thing you want to discover is that something leaked, melted, or otherwise got all over the other items in your go bag. It’s also a good idea to keep a pair of tennis shoes or boots in the car near your go bag. Make copies of your identification papers – any vital information like driver’s license, passport, and advanced medical directives, should something happen, and you are unable to communicate. Also, keep medical information like your blood type (A+, A-, etc.) with the paperwork and seal it in a plastic bag. Keep all personal items in a single outside compartment. This placement makes it easy for someone to find in an emergency and easy for you to get to those items. 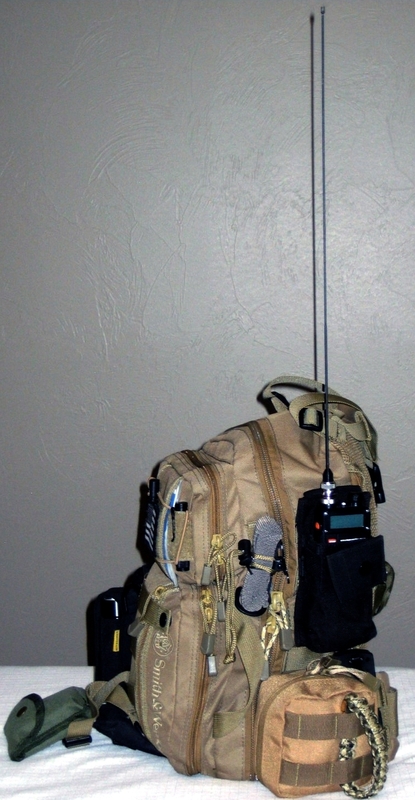 Keep a programmed handi-talkie in your go bag that has every repeater in the state. Also include the FSR, GMRS and NOAA frequencies. Make sure the batteries stay charged. Water purification – You can use drops of bleach, purification tablets r, my personal favorite, the Life Straw®. No matter what – you will need water. Water storage – It could be a surplus canteen, or one bought from an outdoor sporting goods store. 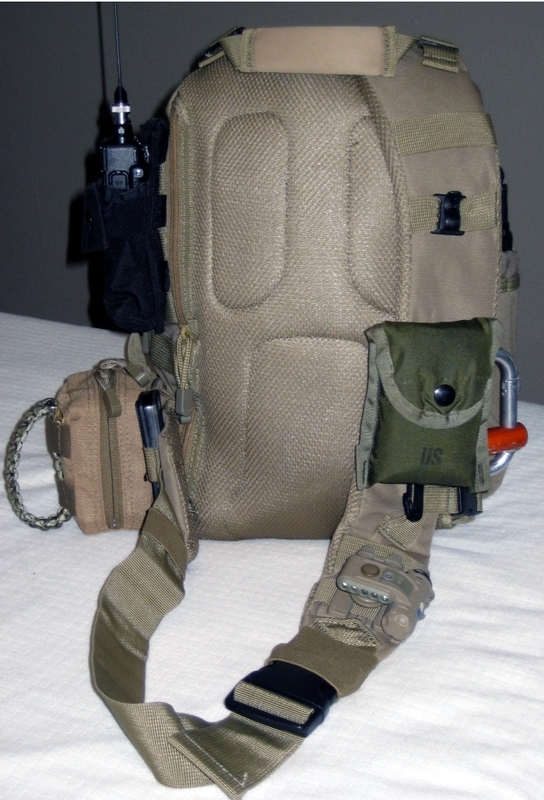 Also consider a bladder system that can be built into your pack, there are several that are made to incorporate a water system, such as the “Camelbak” system. Flashlights, yes plural, because you never know when the night is going to be your friend. These days, you can buy strong lights of 1,000 candle power or more with rechargeable batteries for around $30.00. These lights also let you pick the power you need for the task at hand. Also think about headlamps and two or three light sticks of different colors and make sure one of them is red. Red light insures that your night vision stays intact. They come in different sizes to give you up to 12 hours of light. Personal protection – This is a tricky subject IF you are licensed you may want to carry a pistol – size and type are to your preference but please carry extra ammunition and have some pistol shotshells as well to kill snakes and vermin – or dinner! Most of us already carry a knife but is it large enough for personal protection or general camp duty? Consider a blade that s both smooth and serrated, or you could also add a small machete. Rain and bad weather gear – Rain suits, ponchos, Gortex ®, plastic, small and not so small are some options. Polartec® coats or vests and a hat of some type is also important. I carry a rolled up “Boonie” in my pack. Food – last, but very important is food. Look at freeze dried meals – they are compact and can be packed tight since the bags are very tough. Personal Protective Equipment – Work type gloves, safety glasses and a quality dust mask are worthwhile options to consider. Lots of people have also started carrying gas mask in their vehicle due to the possibility of toxic substances. Like everything else it’s your decision and yours alone. Hurricane Florence has made us all aware of what a disaster can do to our future; that future is now. Tens of thousands had no plan, no kit, and they lost everything. Ask yourself, honestly, “What would I do? Can I care for myself and my family?” Well, could you? 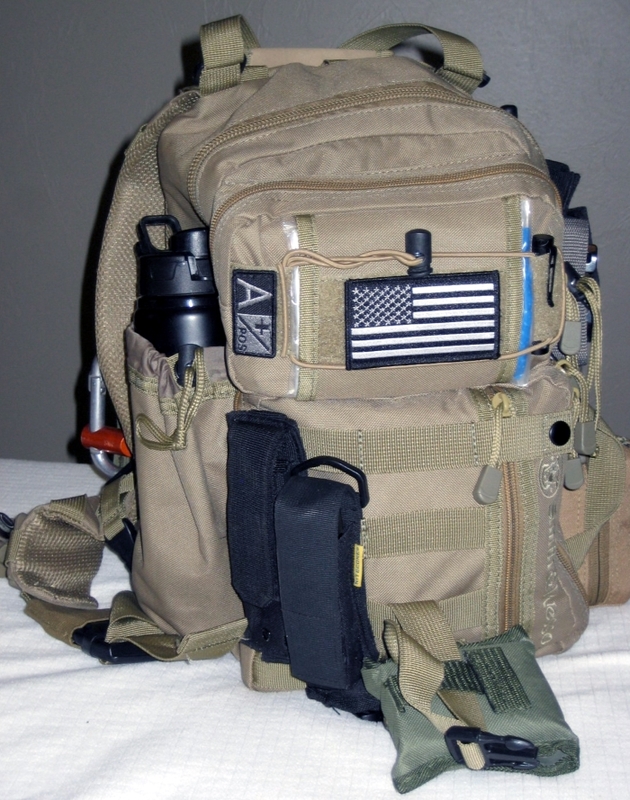 A Go Bag is not much use if you have no idea where you are going. If you have been following along, possibly, you have already started your “Kit” list – the items you feel you must have to survive at least 72 hours. But, did you involve your spouse? Your children? Family members easily and quickly take part when they are asked for help and can see you are thinking about their safety and well-being. Make it fun but make it educational as well. Remember, your spouse needs to know every detail in case you are separated, or something happens to you. Yes, you are a Ham and know how to communicate, but in most cases, they are not. Do you have other types communication for them? They are making better and better FSR (Family Service Radios) these days. Greater range and options along with longer battery life are available now. Also, GMRS (General Mobile Radio Service) which requires a license, but there is no test, is another option which has repeater systems available much like 2-Meters. Check them out and see what fits your needs and have everyone practice using them. History has proven time and time again that cell phones become useless in times of disaster. Either the cell sites are so jammed that it is impossible to make a call or there is no cell site at all. Do NOT depend on your cell phone, after all you are a HAM!!! Plan a rally point for the family, and a second rally point and even a third. These points are where you should meet if there is an emergency. Get these rally points into everyone’s brain. In the middle of a TV show, just ask “What’s our 3rd family rally point?” Another time ask, “What is the family frequency or channel number?” Don’t be surprised when the kids nail it right off – and PRAISE THEM FOR IT! Does your spouse have a Go Bag? If not, why not? Do your kids have Go Bags? They want them! Do you have a vehicle kit for each vehicle? What about NOAA radios? For more family information and ideas go to ready.gov. There is a ton of information, useful lists for ideas as well as ideas for your home and vehicle.